My recent story about shark cage diving made me realize how lucky we are to be living here in South Africa to even have such opportunities. Like I told you, I wasn’t even particularly gung-ho about the idea during the planning stage. We were just doing it for Jabulani’s birthday present. 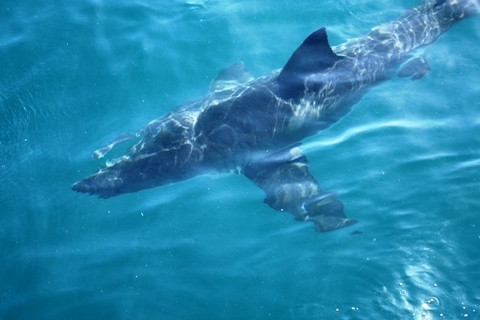 However, having had the privilege to see and meet a great white shark (actually, several of them) in the wild, I now realize how extraordinary that actually was. According to Marine Dynamics, there are only about 3,500 great whites left worldwide, making them rarer than tigers. Read more in this Daily Mail article if you’re interested. Their endangerment is due to many factors, mainly overfishing and hunting. I’m not sure which type of shark actually goes into shark fin soup, or if shark fin soup connoisseurs care one way or another, but it is true that sharks get slaughtered every day for this delicacy. Since it’s only their fins that people want they typically get thrown back without their fins, condemning them to what must be a gruesome death. Killing such a graceful animal just for its fin? This is the same with another endangered animal species we’ve gotten to know quite well since living in Africa. Rhino poaching is a huge problem in Southern Africa, and much like with sharks their killers hunt them down, cut off the horn, and let them bleed to death. 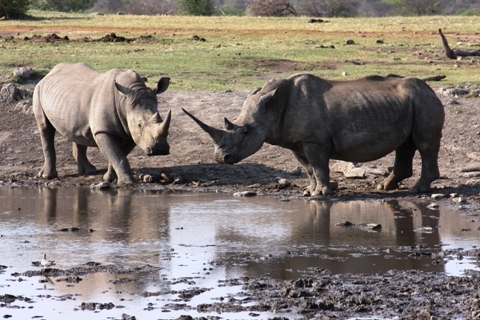 Most game reserves have to expend an extraordinary amount of resources towards protecting their rhinos, lest they be shot at from helicopters at night, or whatever other methods there are. I just read an article about rhino horns being stolen from European museums, even the more obscure ones, which is a direct result of Africa becoming more protective of its rhino population and the thieves trying to find other avenues. Slaughtering these just for their horns? And why all this? Just because some Chinese think that ingesting ground up rhino horn gives them special powers. It’s also the Chinese who are mainly responsible for the demand for shark fin soup. Now I realize it’s not all of China that is to blame, and neither are Chinese consumers the only villains here, as it takes many people down the line to actually get that stuff from here to there. And yet. Without those outlandish appetites, great white sharks and rhinos wouldn’t be in quite the trouble they’re in. And that’s just those two – who knows what other species are hunted and slaughtered for equally dubious goals. The killing of dolphins in Japan comes to mind. You can help by re-posting this article elsewhere – Facebook, Twitter, your own blog. The more people are aware of this, the higher the chance that it will change. Are They Reading my Blog at the NYT? Next PostNext Are They Reading my Blog at the NYT?